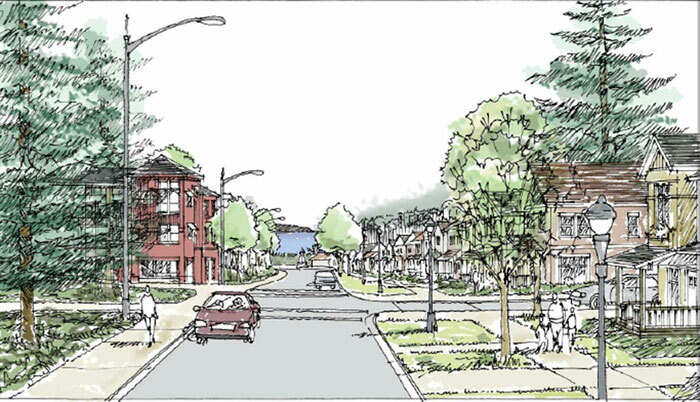 Image courtesy of BDS Planning & Urban Design: An appeal continues to delay the City of Seattle's plans to redevelop the Fort Lawton property in Discovery Park for affordable housing. The months-long battle between Magnolia activist Elizabeth Campbell and the City of Seattle is still in limbo with the Hearing Examiner after a series of requests between the two parties were sent this month. Campbell is leading the Discovery Park Community Alliance in an appeal process against the City of Seattle’s final environmental impact statement (FEIS) for the Fort Lawton Redevelopment project. The FEIS was presented by the city in April. After the Seattle Hearing Examiner cancelled the scheduled hearing on Oct. 29 between the city and Campbell — after the Magnolia resident missed a pre-hearing conference — the Hearing Examiner chose to resolve the appeal case through legal briefings. All briefing documents between the city and Campbell were due on Nov. 14. Afterward, the Hearing Examiner was supposed to have 21 days to make a decision. Campbell and the Discovery Park Community Alliance were supposed to turn in a legal brief by Nov. 9. Campbell and her new attorney, Nathan J. Arnold, submitted her notice of appeal on Nov. 2. Three days later the city filed a motion seeking a dismissal of the appeal entirely, stating Campbell failed to follow the Hearing Examiner’s directions. The city states in the motion it believes the appeal should be dismissed because Campbell did not file an opening brief by Oct. 24, as ordered by the Hearing Examiner, and instead resubmitted her original appeal. The city is also asking the Hearing Examiner to reject Campbell’s request to reopen discovery. Campbell and Arnold submitted a rebuttal to the city’s request to dismiss her case on Nov. 13. “The City’s position that (Campbell’s) Notice of Appeal being used as her opening brief forces it to guess at (Campbell’s) arguments is disingenuous,” the response states. Campbell said she is waiting to hear from the Hearing Examiner, but said she doesn’t agree with the city. “This is not a resubmitting of the appeal,” Campbell said. In a letter to the DCPA email list, Campbell is considering litigation if her appeal is dismissed. “In fact, given the probability that this will be the outcome, preparations are already underway to establish a litigation budget and to start exploring the grounds, the causes of action, for a lawsuit in either King County Superior Court or in U.S. District Court,” the letter states. Fort Lawton on Magnolia Bluff was originally established as an Army installation in the late 1890s. It became Discovery Park in 1972. In 2005, the city had to create a redevelopment plan for the 70th Regional Support Command headquarters after the facility was shut down. The city originally planned to create a mixed-income housing area, but the idea was shut down after neighbors filed a lawsuit, which was supported by the Court of Appeals. In 2010, after further environmental review, the case was resolved but the city had a lack of funding for the redevelopment project due to the 2008 recession. In December 2017, the city announced a preferred alternative for Fort Lawton. The plan included 85 supportive housing units for homeless seniors, 100 affordable rental units and 52 units of affordable ownership housing, totaling 238 housing units on the 7.3 acres. Campbell founded DPCA, as well as the Magnolia Neighborhood Planning Council, which filed the lawsuit that delayed the project. The appellants want to use the Fort Lawton property to expand Discovery Park, and argue the added housing could bring a potential 600 new residents, and with them vehicle traffic that would negatively impact the park’s natural environment. Campbell said her appeal is not a protest to the city’s plan or an attempt to delay. Instead she worries the FEIS did not examine many impact the redevelopment plan would have on the park’s natural environment and surrounding neighborhood. She noted a potential alternative plan that is in the works. • To help the city honor its state commitment to fulfill Discovery Park’s Master Plan. • To help the city and “pro-park interests” partner with key park and natural land stewards to mitigate the cost of the park and land for affordable housing. • To help the city identify other city properties that could be developed for affordable housing. Campbell wrote in the newsletter that the Fort Lawton property is a costly solution to the city’s affordable housing goals. Both the city and Campbell have to wait for a response from the Hearing Examiner.